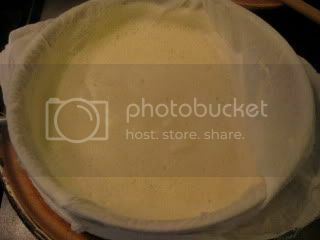 I've posted homemade tofu picture various times in this blog before...and here it is again. I just love making tofu from scratch. Homemade tofu taste just so special. 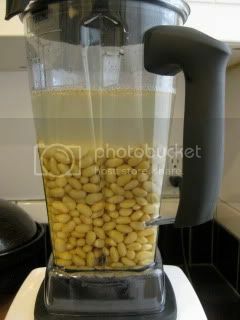 The process for square tofu requires soaking the soybeans in water overnight. Making the soy milk. Coagulating the soy milk with the nigari. And shaping it in the wooden mold. 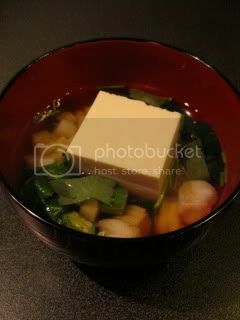 Freshly made square tofu was chilled in the fridge and served as "Hiyayakko" (chilled square tofu). The tofu was topped with a little drizzle of sesame oil, a pinch of ume-shio (plum salt), and minced scallion. Heavenly! The next day, I served the tofu in the cold light broth with shrimp, yamaimo (mountain yam), okra, and mitsuba. It was a perfect summer treat.